A grouping to a 2nd Lt. Joseph DeNicola, 8th AF, 398th Bomb Group, 601 Squadron "Hell from Heaven" flying in a B17 out of Nuthamstead, Hertfordshire, Station 131. Lt Denicola trained as an Air Gunner and then went on to train as a Navigator. His aircraft was shot down on 20th January 1945 on a raid to Mannheim the only 398th aircraft lost on that date. 1. Caterpillar Club badge, maker marked by Maco NY in sterling silver. 2. Caterpillar club original membership card named and dated 17th April 1945. 3. Another Caterpillar club membership re-issued card. 4. 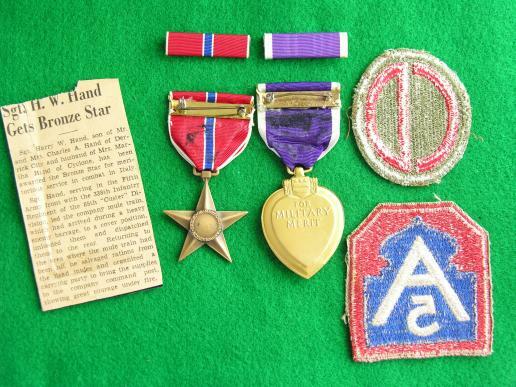 WWII boxed Air Medal complete with medal ribbon and lapel pin. 5. 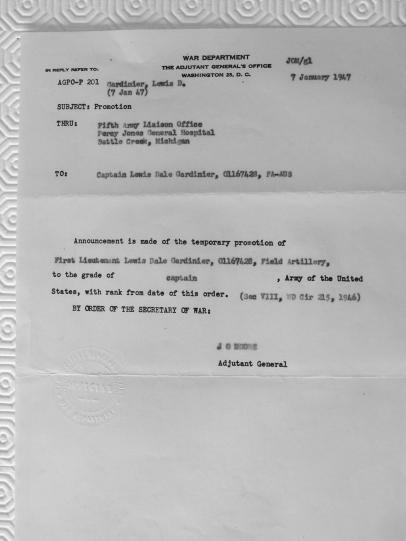 Air medal original citation dated 21 February 1945. 6. Caterpillar Club membership certificate, measures 11" x 8 1/2"
7. Copy of the application for membership of the Caterpillar Club detailing aircraft lost to enemy fire crashing in France also detailing he was in 601 Sq. 8. Four original photos one of the six members of the crew, one in uniform and one with I think his mother and finally an enlisted man don't know who he was. Measures 3 1/2" x 2 1/2". 9. Good conduct medal and ribbon, loop on medal missing. 10. WWII full size Gunner Wing, pin back with safety clasp in sterling silver. 11. Post war Navigator wing clutch back fitting. 12. Short snorter silver dollar bill signed by various persons also details "crossed Atlantic Dec 16th 1944. 13. Two newspaper cuttings one names Joseph DeNicola being awarded Air Gunners wings and the other completing the Navigators training. A scarce and interesting group. 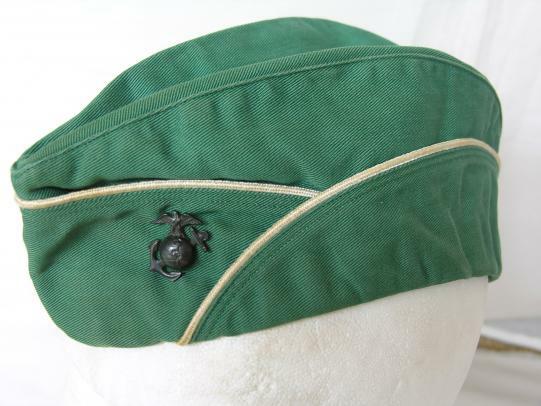 WWII USMC Woman's Female Summer OverSeas Garrison Cap Hat in spruce green with Marine Corps insignia (screw back) Made by Knox of New York. Good condition with slight service wear. 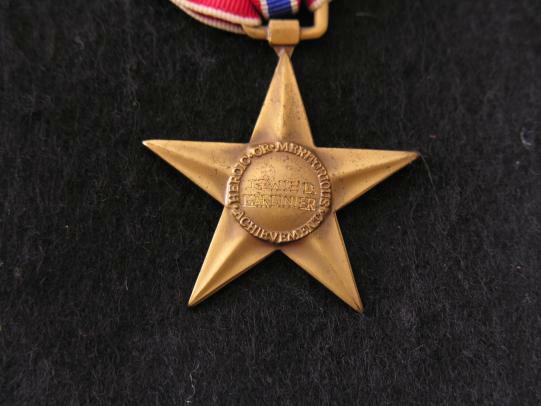 Size is 7 1/8" Front to back measures 10 3/4"
A named Bronze Star and Purple Heart Grouping to a Captain Louis Gardinier officer in the 102nd Infantry Division 379th Field Artillery Group. 1. 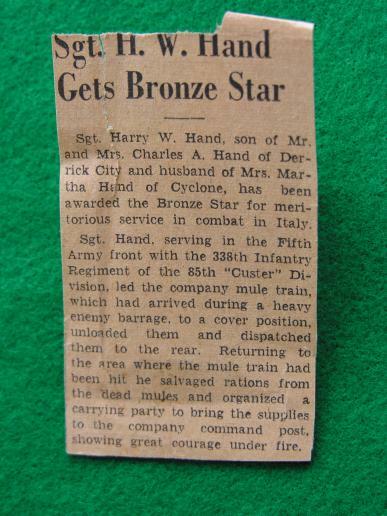 Named Bronze Star Medal awarded for acting as artillery observer continually adjusted artillery fire until he was wounded. As detailed in general orders file. 2. 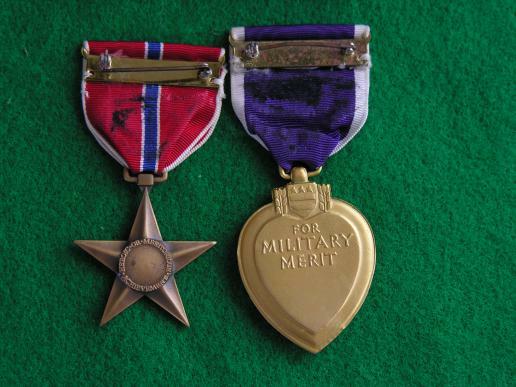 Purple Heart Medal for wounds in the above action. Not named. 5. European Campaign Medal with one battle star. 6. 102nd Infantry Division Patch, used and removed from uniform. 7. 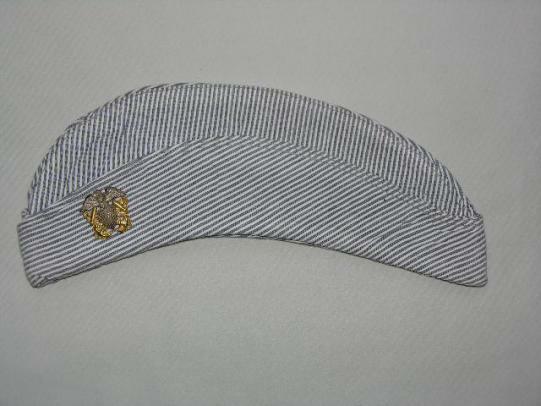 Pair of tan cloth 2nd Lieutenant rank insignia. 8. 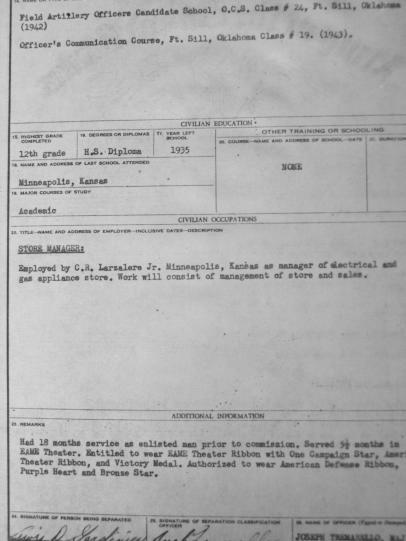 Paperwork file includes, separation record details of service promotion and awards. General order for the Bronze Star action in combat. 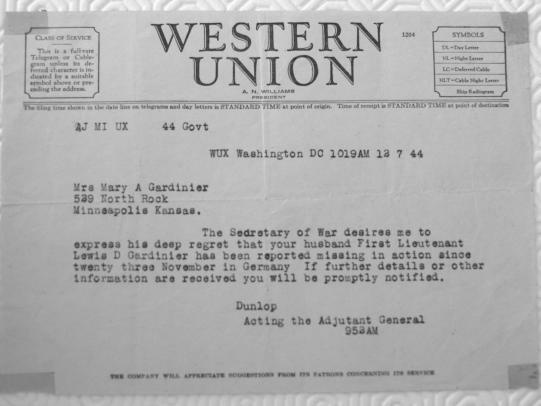 Missing in action telegrams to his wife and a telegram confirming that he is not missing in action. Nice group of medals and paperwork. 2. Named good conduct medal in original box. 5. 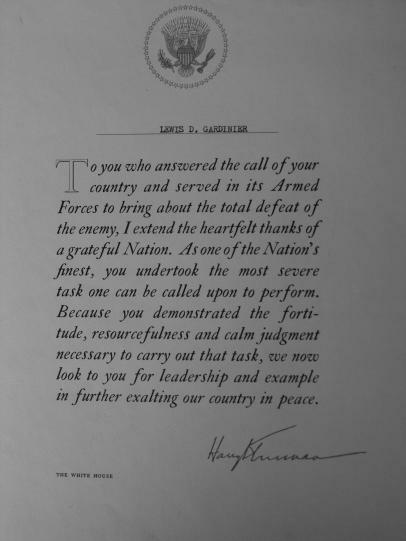 Gold medal for services to the USA in the original issue box. 6. Named ID bracelet in sterling silver with 1/20th gold filled.measures 6 1/2". 8. Double Medal ribbon bar for WAC and good conduct together with 2 x WAC ribbon and 2 x GC ribbons. 9, Honorable discharge "Ruptured Duck" lapel badge, pin back fitting, marked 1/10th gold filled makers mark BB&B. 10. Defence Soft Ball medal, inscribed to the back 1945 Softball, Prov.WAC Bn, Ft. Mamilton N.Y. sterling silver. 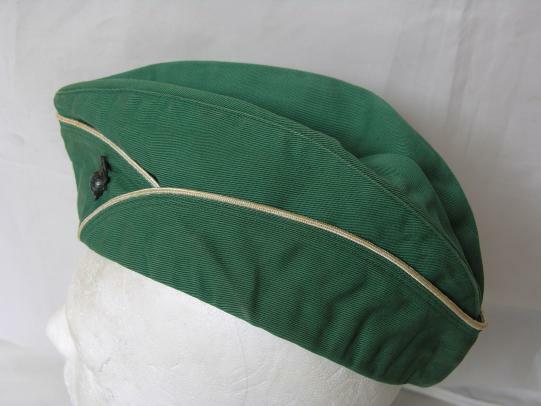 Here is a Women's Army Air Corps medal group to a Major Irene A Sheehy, served in the ETO during WWII. and Japan at the end of the war. Comes with a letter confirming entitlement of medals and awards from USAF Hospital Maxwell, Air University, Maxwell AFB. 1. 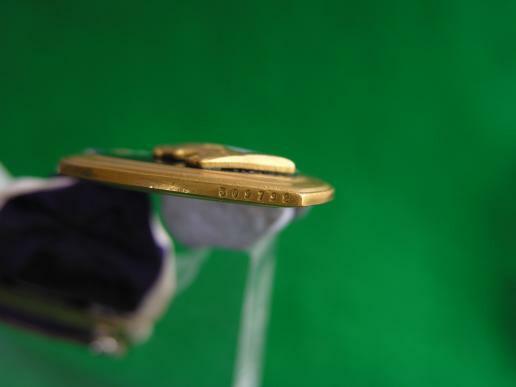 American Campaign Medal in original issue box with ribbon. 2. American WWII Victory Medal in original issue box with ribbon. 3. US Army of Occupation Medal in original issue box with ribbon and Japan Bar. 4. American European ETO Medal in original issue box with ribbon. 5. American National Defence Medal in original issue box with ribbon. 6. American Armed Forces Reserve Medal in original issue box with ribbon. 7. 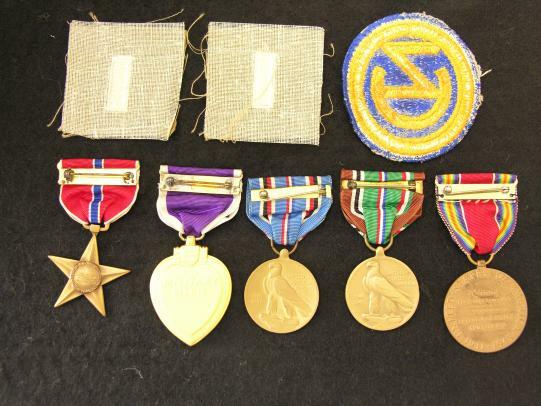 Set of medal ribbons, Major rank, US letters and Air Force Nursing branch of service. All clutch back fittings. 8. 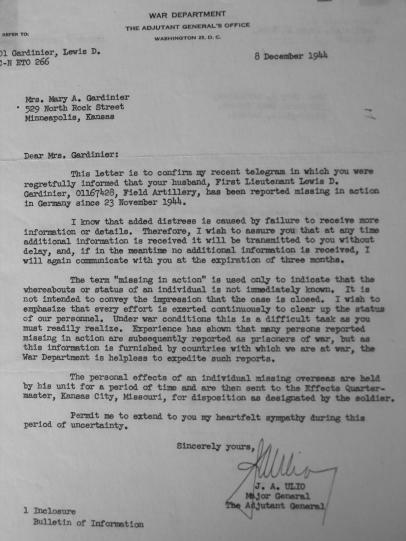 Letter confirming awards and entitlement from UASF University Hospital Maxwell Air force Base. 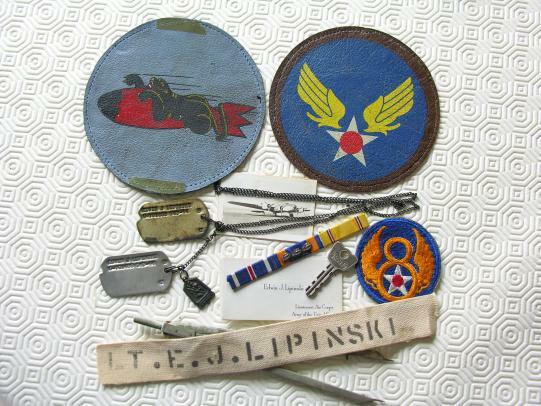 Here we have an excellent grouping of items attributed to 1st Lieutenant Edwin J. Lipinski Bombardier in the 568th Squadron, 390th Bomb Group. The 390th Bomb Group flew B-17 Flying Fortresses out of Framlingham, Suffolk, between July 1943 and the end of the war in Europe. 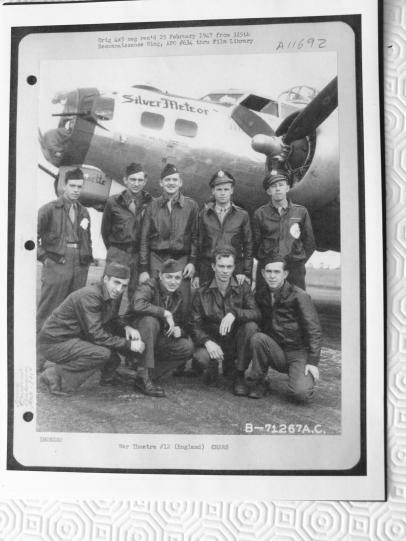 Known to have flown in B-17 Silver Meteor. 1. 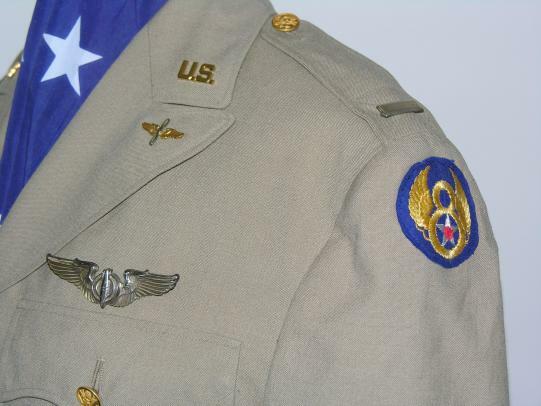 American made labelled and dated 1942 a Tan Uniform Jacket, badged with English made 8th AF and Air Corps patches, a Bombardier Wing pin back in Sterling Silver, Aviation branch of service and U.S. insignia finally Lt ranks pin back in sterling silver. Note two small moth nips to the back of the jacket. 2. 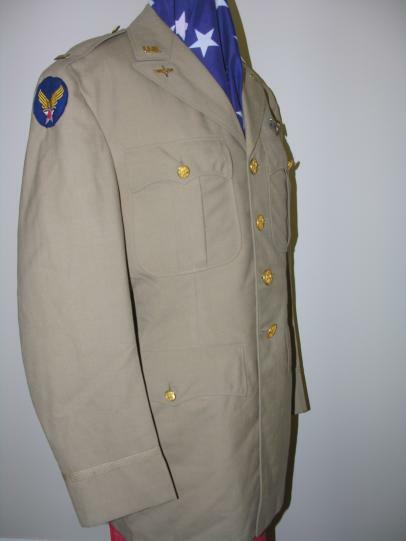 American Made Service Jacket dated 1942, started life as four pocket but cut down and tailored in England to the popular Ike Jacket. 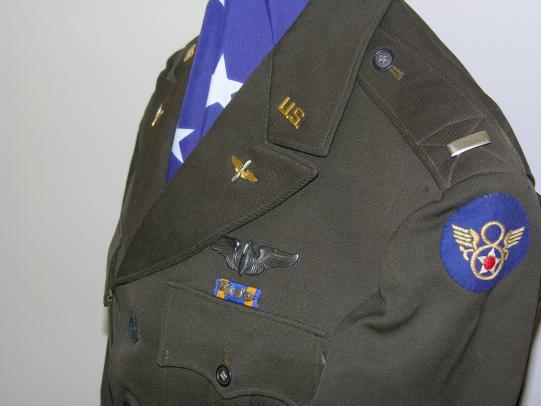 It has an early English made "stubby Wing" 8th AF patch, a Bombardier's Wing pin back in sterling silver, a pin back Air Medal ribbon with 4 oak leaf clusters, Aviation and U.S. insignia and Lt ranks pin back in sterling silver. One small moth nip on the button flap. 3. 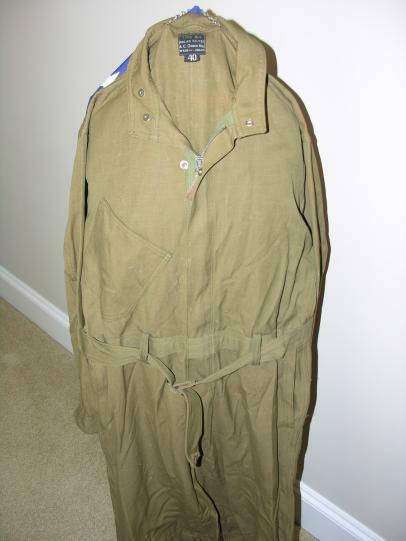 Type A4 Flying Suit with label and in a size 40, good working Crown brand zips to the sleeves and front, complete with belt. Two open topped pockets one on the right lower leg and one to the right front breast. Some service wear, light stains overall and a small wear hole at the bottom of the front zip. 4. Type A-4 Navigation Case in used and aged condition, the tips of the locking straps are missing. Stenciled on the back to Lt Lipinski. Included in the case are 5 various manuals, restricted notes on the auto-pilot settings and instrument calibaration. A red folder containing hand written class notes on instrument setting, bomb fuses, bomb loads, bombing, targets and technical problems. Also included are lots of training notes and manuals. 5. 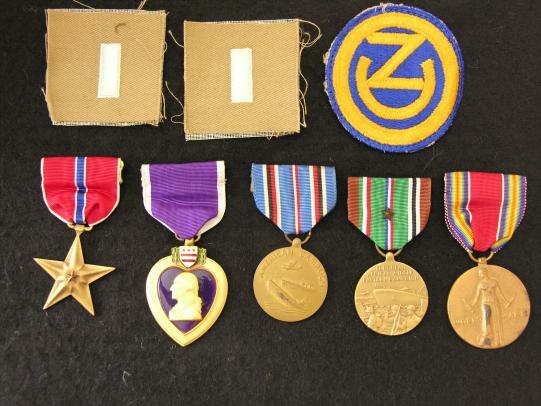 Medals - WWII Box containing a re-issued Distinguished Flying Cross. Boxed original Air Medal. 6. Original 390th Squadron leather jacket patch 5" used and removed from jacket. 7. Original Army Air Corps Leather jacket patch 5" used and removed from jacket. 8. Period issue named Dog Tags on early chain with St. Christopher charm attached and a white woven name tape to LT. E.J.Lipinski. 9. 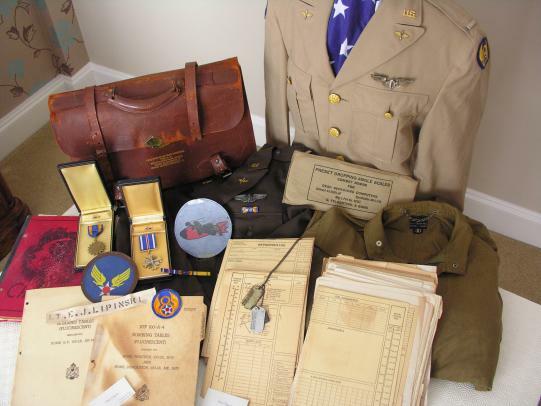 Dead reckoning computer for combat bombing, an 8th AF sleeve patch, two calling cards for Lt Edwin J Lipinski, medal ribbon bar, period pencil and set of dividers. 10. Copies of letter and awards entitlement, cpoy of crew photo and a copy of the Certificate of Service. 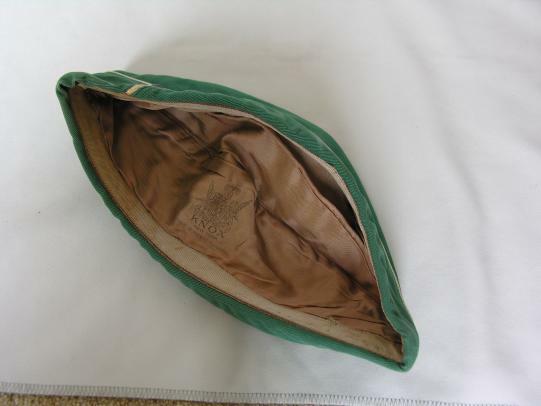 An original US Navy Women's Reserve Officer Garrison Cap named to Lt. Anna E. Gray. 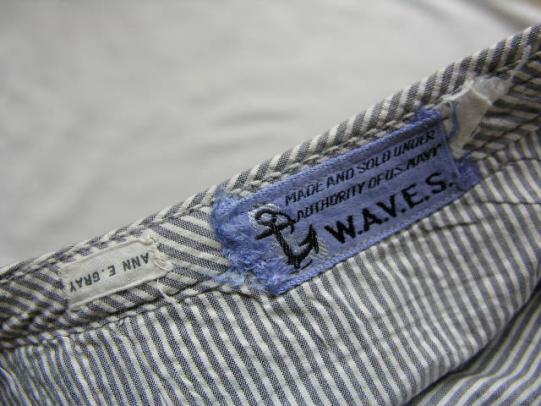 In good condition and is starched. Navy Officer and Lt. Rank (clutch back fittings) Labelled inside. 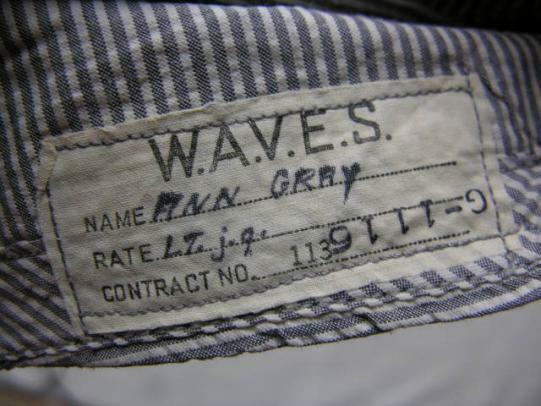 Lt. Anna G. Grey enlisted as a WAVE and was selected for officer candidate school near the end of the war. She attained the reank of Captain retiring in the mid 1960's. This is a large grouping to an 8th Air Force B-17 Pilot Lt. George Instone awarded the Air Medal with 5 oak leaf clusters. He flew 35 missions with the 381st Bomb Group Heavy as part of the 532nd Squadron based at Ridgewell, England. Missions were flown between 29th November 1944 until 20th April 1945. 2. A pair of dog tags named and numbered to George Instone Jr dated. 3. Quality English made chenille Squadron Patch for the 532nd. 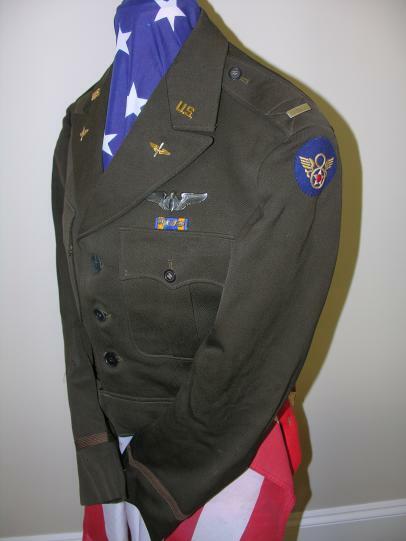 Removed from A2 flight jacket remains in good condition. Measures 5 1/2"
4. U.S. letters clutch back by Blackington. 5. Officer's Aviation branch insignia clutch backs. 6. 1st Lieutenant bars, pin back in sterling silver. 7. Air Medal Ribbon bar with 4 clusters and ETO with campaign star. English made pin back. 8. 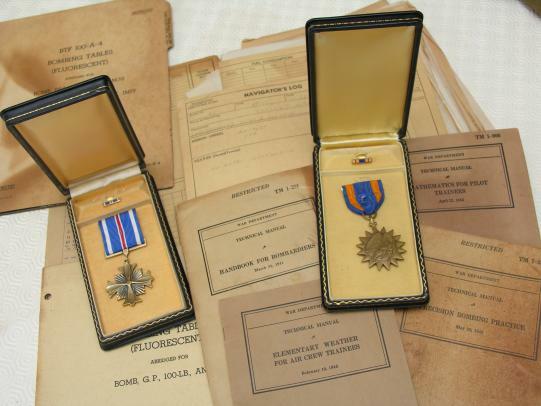 Pair of Dog tags named to George Instone Jr.
A fragment of German Flack. 10. 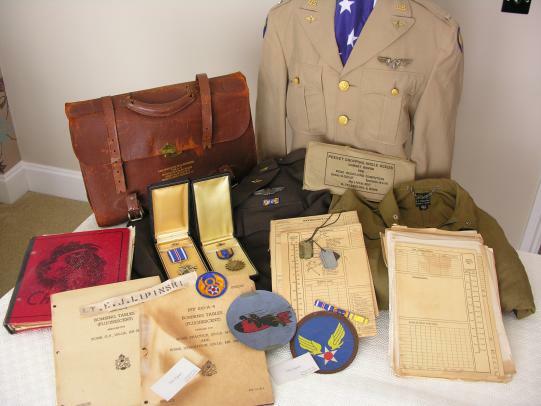 8th Air Force and an Army Air Corps sleeve patches plus two match book covers and a calling card of Lt George Instone Jr.
11. leather A2 name tag Lt G.C. Instone and Pilot and Air Crew Physical record card. with 4 clusters. Missing lapel pin. 13. Tan service tie inked on the back with 35 missing and dates. Very unusual and rare. 14. 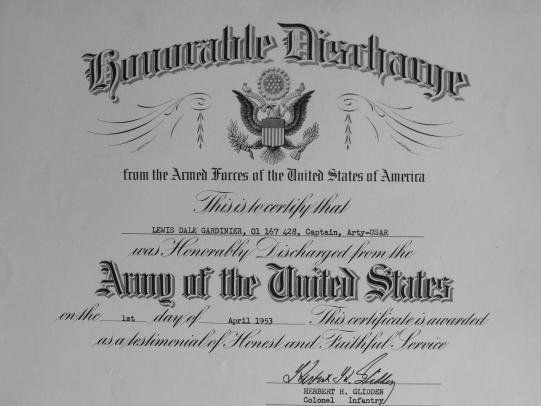 Various original papers including Enlisted Aviation Cadet honorable discharge certificate on completion of pilot training. Detailed Mission list places and dates. 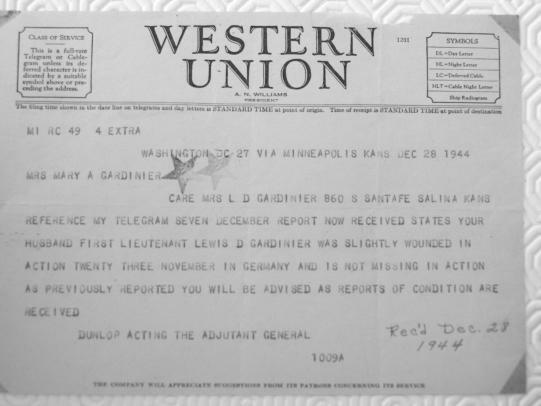 381st Group letter signed by Brigadier General William Griggs.detailing combat experience. 15. Large London studio photograph of George Instone with his co-pilot and navigator. 16. Large Crew photo detailing names taken at Biggs Field Texas. 17. Set of 8 original 532 Squadron combat photos in flight action over England and bomb runs over Germany. 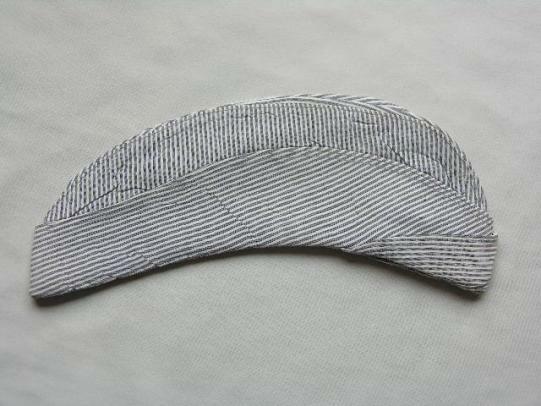 Measures 5 7/8" x 3 3/4"
18. Set of 4 photos 2 of Lt. George Instone and 2 crew photos. 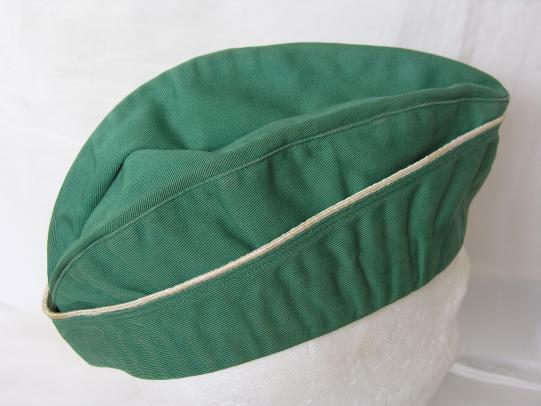 Measures approximately 5 1/2" x 4 1/4"
19. Class book Final Approach George is in there. also Aviation Cadet Training booklet and a booklet on the Operation of the C-1 Autopilot. Finally a leather bound pilot graduation invitation. 20. The Intercom, 13 copies of the 381st Group association newsletter. 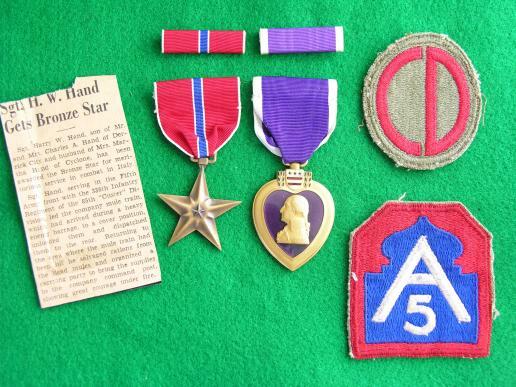 Here is a Bronze Star and Numbered Purple Heart Medal Grouping awarded to Sgt Harry Hand of the 338th Infantry 85th Infantry Division, also included is an 85th Division patch and a 5th Army patch and a newspaper cutting describing the action. He led a mule train, which arrived during a heavy artillery barrage to a cover position unloaded them and returned to the area later to salvage more rations from the dead mules whilst under fire.